Asphalt (tarmac) road surfaces laid down in the 1980s or earlier may contain coal tar. Coal tar was commonly used as a binder in road construction, before being superseded by bitumen. By the 1980s, coal tar was largely confined to a surface dressings, but up to the 1970s the main binding material of the asphalt was often coal tar, rather than bitumen. Renewal of many such roads leads to the production of a recycled aggregate known as ‘road planings’. Road planings are produced by heavy machinery which literally planes the top few inches off the road’s surface, providing a flat substrate onto which new tarmac surfacing is laid. Road planings provide a useful (and often free) aggregate that has long been utilised as a low cost surfacing for industrial yard space, farm lanes and the like. However, coal tar is classified as hazardous waste, since it contains significant quantities of polycyclic aromatic hydrocarbons (PAHs), a group of carcinogenic compounds. The concentration of PAHs in coal tars is typically more than 15,000 times higher than in bitumen, which is not classed as hazardous. In addition to roads, coal tar was extensively used for other hard structures, such as pavements, carparks and airfields. All of these may give rise to considerable amounts of hazardous waste when renewal is required. Planings containing coal tar are sometimes referred to as ‘asphalt waste containing coal tar’ (AWCCT). AWCCT is deemed hazardous waste, and far from being freely used or disposed of use, must be manged and disposed of correctly to avoid environmental contamination. Coal tar containing road planings may present a source of risk to humans health via dermal contact, and inhalation or ingestion of dust. As relaid road planings are much more permeable than fully bound asphalt, leaching of PAHs presents a high risk of surface water and groundwater contamination. Where the presence of coal tar is deemed possible, it is considered good practice to determine whether or not it is there prior to starting work, so that the extent of any problem is known. It is important to avoid mixing uncontaminated material with that containing coal tar. Maintenance records, if available, can give useful information about whether bitumen or coal tar was used on a particular road. However, records of the materials used for road construction prior to the 1980s were often not kept in the first place, or have become lost over the years. Core samples can be taken where there is still doubt, or trial pits can be dug and then sampled. The number and spread of cores or pits should be sufficient to give an overall picture of the extent of the tar, both horizontally and vertically. If it can be shown that tar is confined to a particular layer, or else to a particular area of the road, treatment or disposal costs can be greatly reduced. Testing planings only after removal is not considered good practice, since bitumen based material may become contaminated with coal tar based material, thus increasing the amount of hazardous waste. The option of leaving lower layers in-situ is no longer available if removal takes place before testing. Also, a large amount of potentially hazardous material will have to be stored while analysis is awaited; significant delays at this point may interfere with the contract schedule and cause logistical problems. If the percentage of coal tar in any road waste material is greater than 0.1% w/w, then the waste must be classed as hazardous. The relevant European waste code is 17 03 01, ‘bituminous mixtures containing coal tar.’ However, it may be difficult to detect small amounts of coal tar when mixed with other materials, such as bitumen, which may be very similar in appearance. In practice, it can be hard to tell if the amount of ‘coal tar’ in a sample is 0.1% or 0.2%. If the material if found not to contain any tar, it is classed by the waste code 17 03 02. Legally, all waste must be properly assessed and classified, as described in the Environment Agency’s WM3 Technical Guidance. If the decision is made to dispose of the material to landfill, Waste Acceptance Criteria (WAC) testing will still be required. Testing for the presence of individual PAHs is typically carried out. It is important that this is done in a UKAS accredited laboratory. Analytical testing typically involves the quantification of 17 different PAHs by GC-FID or GC-MS techniques. These PAHs are: acenaphthene, acenaphthylene, anthracene, benz(a)anthracene, benzo(a)pyrene, benzo(b)fluoranthene, benzo(g,h,i)perylene, benzo(k)fluoranthene, chrysene, coronene, dibenz(a,h)anthracene, fluoranthene, fluorene, indeno(1,2,3-c,d)pyrene, naphthalene, phenanthrene and pyrene. Phenol concentration in leachate is tested for at the same time as PAHs. Phenol is not itself a PAH, but is typically found in coal tars. Phenol is toxic to aquatic life and much more water soluble than PAHs, so more prone to leaching. In practice, if any significant amount of coal tar is present, the above criteria will not be met. It may be possible to produce a site-specific risk assessment on ‘failed’ material, showing that their use on a particular site should be allowed. However, it is not clear whether such an undertaking would be allowed in practice. Expert advice should be sought if such a move is being considered. If the total concentration of these 17 PAH compounds is greater than 25 ppm, then the material must not be used in a hot process, since high levels of PAH compounds could be released. Benzo[a]pyrene is a common, carcinogenic PAH; it is sometimes used as a marker for total PAH, to avoid the need to quantify the many different PAH compounds that may be present in a sample. However, such a procedure will only give a rough estimate of the amount of PAH present, since the ratio of benzo[a]pyrene to other PAHs may vary, depending on the source of the coal tar and the rates of leaching, volatilisation and degradation of the different PAHs over the years. A so-called ‘PAK marker’ is available from the Dutch company Interlab (PAK is the Dutch abbreviation for PAH), which is claimed to detect PAH compounds down to a level of 150ppm. The white spray turns a light brown or yellowish colour if PAH compound are present. A UV lamp will confirm the presence of PAH, as the brown or yellow colour will appear as a lighter yellowish green colour under UV. These quick tests can be used to determine the presence of PAHs, without the expense of laboratory testing. It may be that PAHs are confined to a particular portion of the road, such as the lower layers, so that the rest can be replaced without the expense of dealing with hazardous waste. However, such marker tests do not give exact figures for PAHs, so some samples may still need to be sent to a laboratory. Another non-quantitative test involves the use of white spray paint, which gives a brownish colour when coal tar is present. However, this procedure cannot be recommended, since it cannot be guaranteed that such a test will work for all possible paint formulations. A third test involves adding a drop of methylene chloride (dichloromethane) to a small sample of material on a filter paper. Coal tar gives a yellow-brown stain, while bitumen gives a deep brown stain. This test is unlikely to detect small amounts of tar in bitumen. The results of sampling determine whether hazardous material is present. If contaminated material is confined to the lower layers, it may be more economical to redesign the project, so that the coal tar is left in-situ. If removal is required, then treatment and re-use need to be explored. As the expense of simply disposing of contaminated road planings as hazardous waste is high, treatment and re-use of road planings containing coal tar is an option that needs to be carefully considered. Since adding coal tar planings to a hot process is not permitted, a cold treatment has to be used. Prior to any work commencing, a health and safety information pack should be produced, detailing the planned work, and containing risk assessments for site workers, the general public and the environment. Once work is completed, the exact position of all recycled material containing coal tar in the resurfaced road should be clearly recorded, so that there will be no uncertainty when subsequent work is undertaken. Local authority records, such as ‘Pavement Management System’ records, should be completed as required, including the results of all investigations and analysis. A cold bitumen foam mix is often used to coat planings containing coal tar. Cold bitumen emulsions can also be used. Another possible method of treating planings is by using a suitable hydraulic binder, such as Portland cement, which binds the contaminated aggregate. Careful expert evaluation is required in order to determine the best approach to any particular project. Eurovia Roadstone’s ‘Foambase’ method is an example of a cold bitumen foam mix, in which water is used to produce a foam with bitumen; the conditions must be precisely adjusted in order to produce a stable foam. The foamed bitumen is then mixed with the material to be treated (the latter is moistened prior to treatment). The foam gradually collapses, giving a bitumen coating to the tar-containing aggregate, which is then classified as a ‘cold recycled bound material’ (CRBM). Foambase is offered in two grades: ‘storage’, for footpaths and quiet minor roads, and ‘heavy duty’, for major roads and busy minor roads. The Foambase system was used to treat material from a renewal project on a busy road in Worcester. Treatment was carried out in an old car park next to the road, so that material did not technically leave the site. Workers wore protective clothing when dealing with the material before and during encapsulation. The encapsulated material quickly solidified after being laid, and it was possible to add a surface layer above the treated material after only two hours. About 900 tonnes of treated aggregate was reused on the road, the composition of which was 80% recycled asphalt containing tar, 15% pulverised fuel ash (PFA), 3% foam binder and 1% cement. The saving due to the recycling process was estimated at greater than £100,000. Subsequent monitoring of the site by the Local Authority showed that there was no cause for concern about the durability of the road, despite it incorporating a very large amount of treated recycled material. Another example of the use of foamed bitumen, this time using the ‘Foamix’ system was published by the waste charity, WRAP, as a case study. The project involved extensive resurfacing of the A66 near Darlington. Initial core sampling showed that coal tar was confined to a particular layer in the road. The contaminated material was treated on site with bitumen foam, and then reused. About 9,000 tonnes of hazardous waste was reused. The recycled material was placed in the lower layers of the new surface, so that it would not be affected by any subsequent small-scale patching work. The treatment of the material was carried out in an old compound near the road. It was agreed by the Environment Agency that this could be classed as part of the site, thus avoiding the need for numerous consignment notes as material was moved back and forth. Close liaison with the Environment Agency and the local authority was required, both before and during the project, to ensure compliance with all regulatory requirements. The total cost saving from the treatment and recycling was estimated at £1.3m. Lower carbon emissions and a reduced requirement for lorry transport of aggregates were other benefits from the recycling process. Another foamed bitumen system is Tarmac’s ‘Ultifoam’. This was used during the Highways Agency’s refurbishment of the A11 near Thetford in Norfolk in 2013/2014. The old single carriageway road was replaced with a new dual carriageway. The Highways Agency was keen to minimize the disruption to local communities caused by this large-scale project. The material from the old road contained high levels of coal tar. It was crushed, screened and treated with fresh aggregate, bitumen foam and hydraulic binder on site, using an Ultifoam mobile plant. The treated material was incorporated into pavements and side roads, rather than into the new main road. Over 3,600 tonnes of material was treated in all. It was concluded that significant reductions in cost, carbon footprint, and the number of lorry journeys required for the project were achieved. PAHs are a group of chemicals formed during incomplete combustion. Smoking, wood burning, vehicle engines and barbecuing meat give rise to small amounts, but greater amounts are found in coal tar. Prior to the introduction of natural gas, coal tar was formed in large quantities as a by-product of town gas production from coal. Much of the coal tar was used on Britain’s roads. There are two main types of coal tar: high temperature tar (or coke oven tar) and low temperature tar. The former tends to be higher in PAHs, while the latter is less viscous. Materials derived from coal tar, such as coal tar oil and coal tar pitch, also contain PAHs. These materials were also used on roads, alongside coal tar itself. Occupational studies have shown that working with coal tar increases the risk of cancer. However, despite all the concerns and regulations about coal tar in roads, diluted coal tar is commonly used in medical preparations to treat skin conditions, such as dandruff and psoriasis, apparently without a significantly increased risk of skin cancer. It is possible that breathing in coal tar compounds is riskier than dermal exposure for humans, although this is by no means certain. PAHs are chemically composed of carbon and hydrogen (i.e. they are hydrocarbons); the carbons form a variety of fused five and six-membered rings. The smaller PAHs are somewhat volatile when heated, so exposure to hot tar can lead to breathing in some PAHs. As well as the various PAHs found in coal tar, similar alkylated PAHs may occur (compounds with side chains protruding from the rings), along with heterocyclic compounds; the latter contain nitrogen, oxygen or sulfur, in addition to carbon and hydrogen. Some of these alkylated and heterocyclic compounds are known to be toxic. In the future, testing for various extra compounds may be required, in addition to the listed 17 PAHs. The material must meet all the requirements of the appropriate ‘Specifications for Highway Works’. For cold bound material, clause 948 (Ex Situ Cold Recycled Bound Material) from ‘Specifications for Highway Works, Series 900’ is relevant. The material is only used in sub-surface, not surface, layers. The relevant objectives of the Waste Framework Directive are met, i.e. there is no risk to human health, no damage to the environment, no deleterious effect on the countryside, nor any nuisance caused by noise or odours. Simplified quarterly consignee returns are required from users on the material received, but individual returns are not needed for each batch delivered. Consignment notes still need to be filled for all transport, as they would for any hazardous waste. It should be noted that the Position Statement does not cover the treatment of the material, only its use, so an environmental permit will normally be needed for treatment. A similar Position Statement on the processing of tar-contaminated aggregates would help decrease the paperwork involved in encapsulation procedures, but so far nothing has been issued. The Position Statement applies to England only, so consultation with the relevant agencies and local authorities will be needed for projects in Scotland, Wales or Northern Ireland, to see whether a similar approach will be allowed. 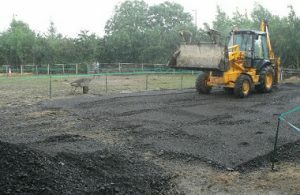 The Environmental Agency has been consulting with road construction firms and local authorities with regard to issuing further advice on the treatment and use of coal tar contaminated planings. The Agency has stated that it plans to issue a new ‘quality protocol’ with regard to such material, but the exact timeline is unclear. The aim is that specified treatment methods will be described, after which the treated material would no longer be classed as waste. Appropriate tests and end uses for the treated material would be outlined, bringing much-needed clarity to this area. Local authorities and road builders have long been waiting for new, more comprehensive regulations to be issued. These are being developed in the context of the ‘European Pathway to Zero Waste’ initiative. In general, there is a fundamental conflict between the drive for ever stricter controls on carcinogenic substances (with the exception of cigarettes and alcohol), and the drive to encourage recycling and minimize disposal to landfill. This conflict is not confined to the issue of coal tar. It is to be hoped that the new regulations will further reduce the regulatory burden and encourage the proper treatment and reuse of contaminated planings. It is advantageous to determine the extent of any coal tar contamination at the planning stage of a project, so that the most appropriate measures can be put in place. If carried out correctly, treatment and reuse of contaminated planings can result in substantial financial savings. Various bitumen foam mix systems have been successfully used in large-scale projects to coat coal tar containing aggregates. Evaluation of the available technology and the associated regulations is a complex procedure. Expert advice should be sought at the planning stage, in order that a cost effective solution that complies with the relevant regulations is chosen. Great regulatory clarity is required in this area, so that the industry has a clear path to follow. Brocklehurst M. (Environment Agency), ‘Beyond Regulation’ (2011).